The entire project was produced in Monroe, NY where most of the children are from as well as the location of the home and studio of the multi-talented, Chassidish, soft-spoken young man who is the project’s producer, Moshy Kraus. The name of the studio is MK Studios, which is the place where Moishi Kraus works his daily magic on many interesting projects, all with the common factor that they are Heimish, Chassidish and incredibly creative. 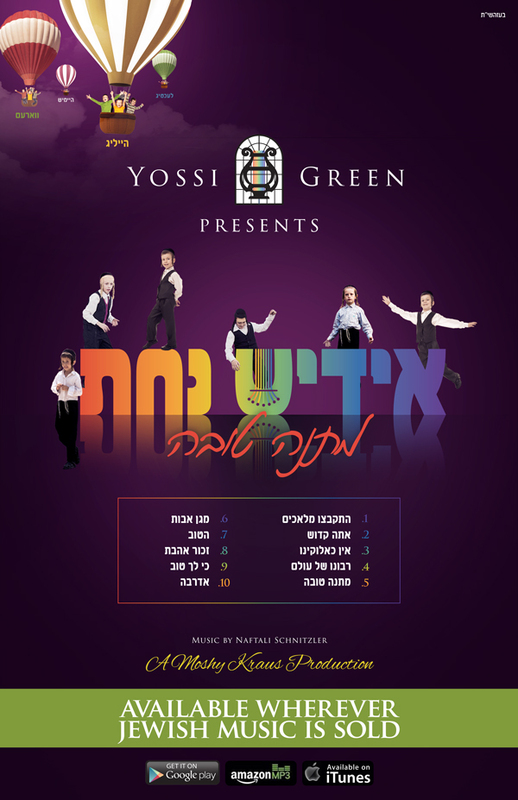 The fresh and innovative tasteful orchestrations were created by the “artist” Naftali M. Schnitzler, a person who has burst onto the Jewish music scene and has mastered the craft of arranging and interpreting Jewish Music with a Taam known in Yiddish as a Noch-Taam – נאכטעם. This means that when you hear his arrangements you want Noch or more! Every time Green listens to the tracks, he cannot help but smile. In his words, “composing songs for such a project gives me the freedom to write melodies that are totally interpreting the message I feel in the lyrics without consideration of other factors like whether they fit into a genre of Wedding Dances, etc. Wedding Dance music is important and has its place, but never ever will they replace Jewish Music in general.” In keeping the project organic, all its artwork was created in Monroe by a young man who combines cutting edge design with a Chassidishen Taam,Duvid Kaufman of Dart Design. Duvid is an emerging and rare talent with a vision of marketing combined with creativity who completes a trio of production, orchestration and artwork, all hailing from Monroe, NY.